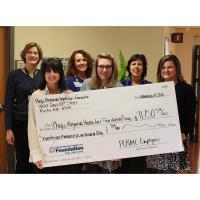 Almost 300 PCRMC employees came together for the Annual Employee Giving Campaign in October to support causes they care about at the Phelps Regional Health Care Foundation. The annual campaign gives employees the chance to donate to one of the twelve funds at the Foundation. This year, employees raised an incredible $71,750.59. Donations made will help support the local and surrounding communities meet the needs of individuals and families throughout the year.